I’d been looking forward to this gig for some time. 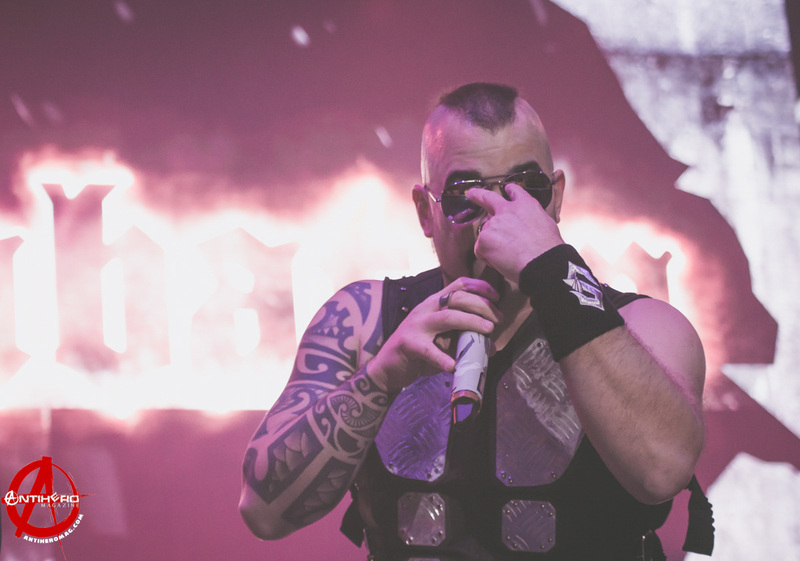 A huge fan, I’ve seen Sabaton on several occasions and every time I’ve come away, mind blown and grinning from ear-to-ear. I was somewhat more ‘curious’ about German thrash metallers Accept, however. I’d done my usual research on the band, listened to a good few tracks but was, shall we say, a little underwhelmed. But, a live band is almost always completely different to their edited and mastered recordings, so I arrived in time for their set with an open mind. I was quite surprised on entering the 2.5k capacity standing area of the Apollo. Unusually for many support bands, it was already near capacity, so Accept obviously have a much larger UK fan base than I expected. Perhaps I was a little too quick to judge after all. Amid my pondering and absorbing of the atmosphere, the lights dropped and Accept hit the stage with their appropriately titled opening track, “Stampede,” and boy was it loud. Although full of energy, their synchronized guitar moves were very typical 80s style and did little to impress me. The crowd responded much better though as they blasted through their first three songs, “Stampede,” “Stalingrad,” and “Restless and Wild,” with clichéd 80’s cheese that so many aging (and not so aging) fans absolutely love. Filled with excitement, fists pumping and heads nodding… Had a missed something? By track 4, “London Leatherboys,” I was foot-tapping and by the time they burst into “Final Journey,” I was going as nuts as the audience. This band is a whole lot more fun than I expected. 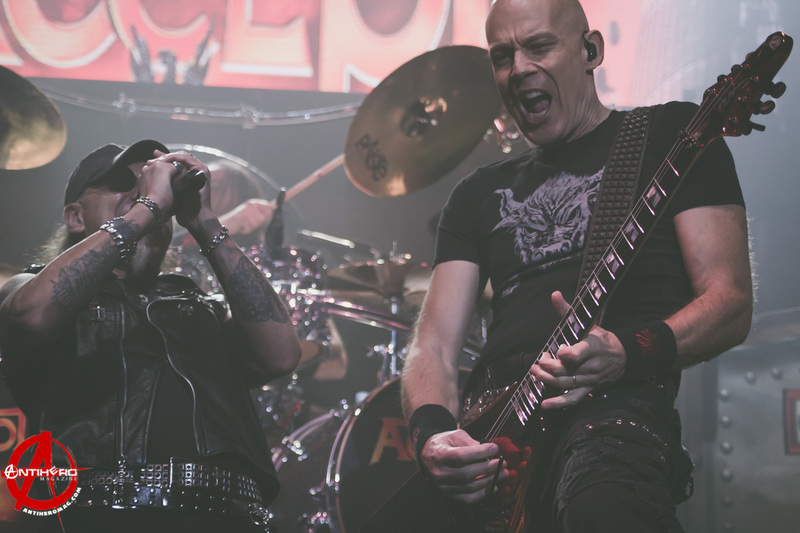 If you like your metal loud and raw, with a huge chunk of 80’s cheddar, you can’t ask for more than Accept. 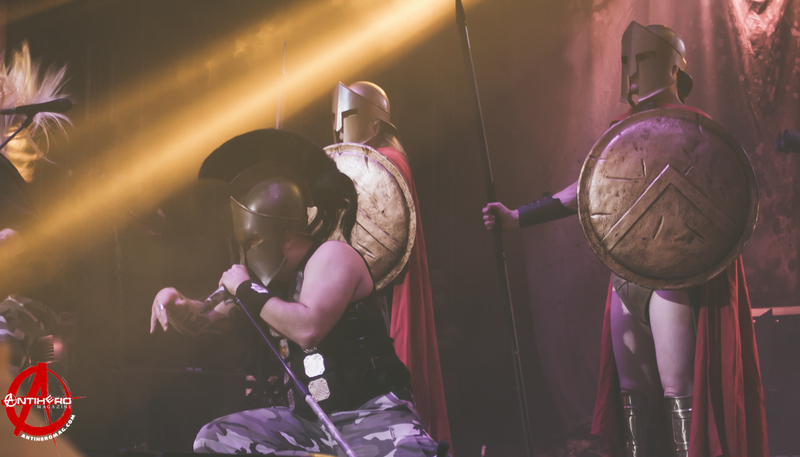 “Sparta” in particular was taken to a whole new level of theatrical stage show with the addition of warrior helmets, spears and shields. I’m a huge fan of the latest trend in added theatrics and as expected, this didn’t overshadow the musicianship of the band with every single person completely absorbed by Joakim’s deep, raw voice and stage presence. The set blistered along with an exceptional mix of old and new songs including “Swedish Pagans,” “Carolus Rex” and “The Last Stand.” The crowd erupted when they performed “The Winged Hussars” from their latest album The Last Stand, proving that, although evolving, Sabaton are still fully capable of producing an album of impeccable calibre, keeping fans hooked and drawing in a new generation of admirers. Of course, a Sabaton gig wouldn’t be a Sabaton gig without their ball grabbing classic, “Primo Victoria.” By this point, well-fueled and full of beer the crowd went wild and shouted for more, despite it nearing the end of their set. They couldn’t leave it their though and an encore of what is set to be a new classic, “Shiroyama,” “To Hell and Back,” and “Masters of the World,” gave us one hell of a climax. Some would say that Sabaton are a “love ‘em or hate ‘em” band. I disagree completely and until you’ve seen them perform live, I wouldn’t judge. This is a mesmerizing band, one that will make you forget where you are whilst being sucked into the Sabaton bubble. Once they start, there is no way of tearing your eyes away from the stage. This isn’t just music; it’s theatre, it’s education through their well-informed lyrics, it’s pure talent and passion. This is exactly why I love them.